Identify missed business opportunities, find untapped niches, uncover low-competition long tail keywords and discover exactly what people are actively searching for in any market or niche. What is Power Suggest Pro? 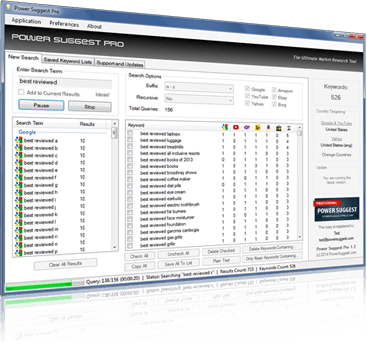 Power Suggest Pro is a keyword and market research tool that leverages on multiple search engines to reveal millions of popular search phrases people are typing into search engines every day. Unlike most research tools on the market which are based on data from Google Keyword Planner, Power Suggest Pro works by harnessing live keyword suggestions from search engines, which means you'll not only uncover much more low-competition keywords but you'll also get the most up-to-date, effective and highly descriptive keywords exactly as they were typed into search engines by real people. 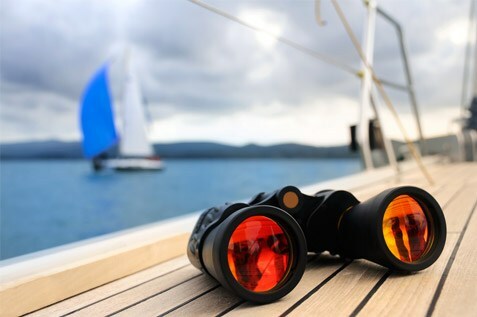 Integrated with major authoritative and strategic sources including Google (#1 search engine), YouTube (#1 video sharing site) and Amazon (#1 online retailer), Power Suggest Pro gives you the true bird's eye view of what millions are actively searching for every single day and enables you to discover opportunities unknown to your competitors. Hundreds of millions of people worldwide use online search engines on a daily basis to seek help and solutions to all kinds of problems, research products and services before they make buying decisions and to locate specific items for purchase. Every search phrase is in fact an expression of the needs, wants, interests and desires of people. Imagine how your business would benefit if you could analyze the exact search phrases related to your business and customize your product or service to serve the actual needs of your customers. The immense amount of market insights that can be gleaned will also enable you to identify new opportunities, find profitable niches and spot market gaps in your industry. The only way to get these raw search terms is from the keyword suggestions of search engines. Doing this manually is extremely tedious and time-consuming. 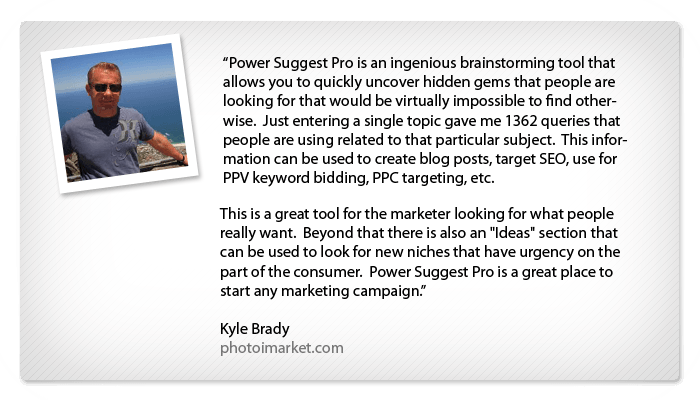 With Power Suggest Pro, you'll extract thousands of these keywords in seconds with just a few clicks. It is almost like having "consumer language" at your fingertips and that really opens up a whole new world of opportunities and profits for your business. 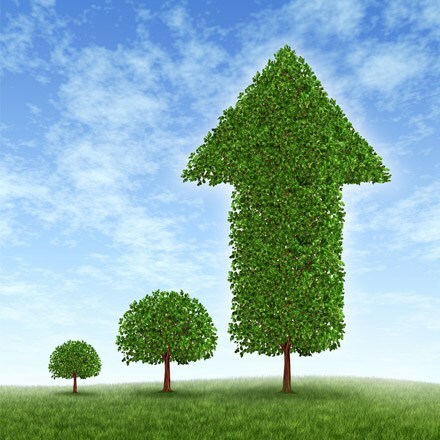 What Does It Mean For Your Internet Marketing Efforts and Online Presence? If you have an online business presence, you most likely already understand the importance and value of natural search engine traffic to build an audience, generate leads and increase profits for your business. 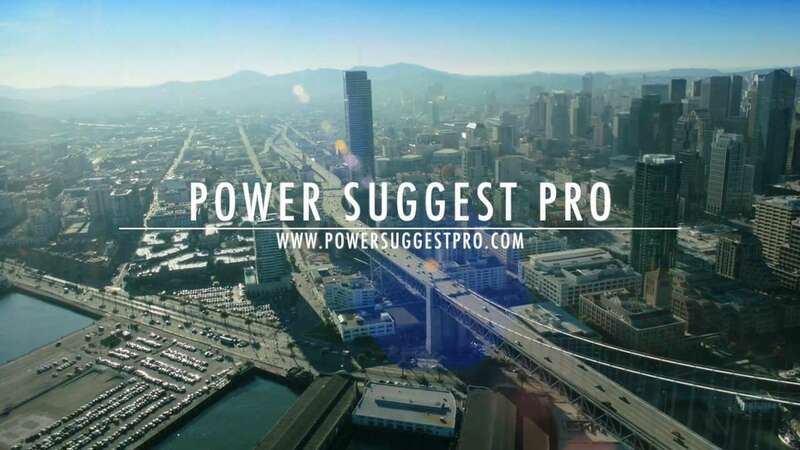 If you are struggling to get good traffic from search engines, wondering if your contents are really targeting the right keywords, or spending hours trying to figure out topics to write for your blog or website, Power Suggest Pro will save you a lot of time and heartaches. Whether you are building an authority blog, a niche website or an online business website, Power Suggest Pro will boost your content marketing and keyword research efforts by uncovering highly effective and descriptive long tail keywords that actually bring in traffic and increase profits. 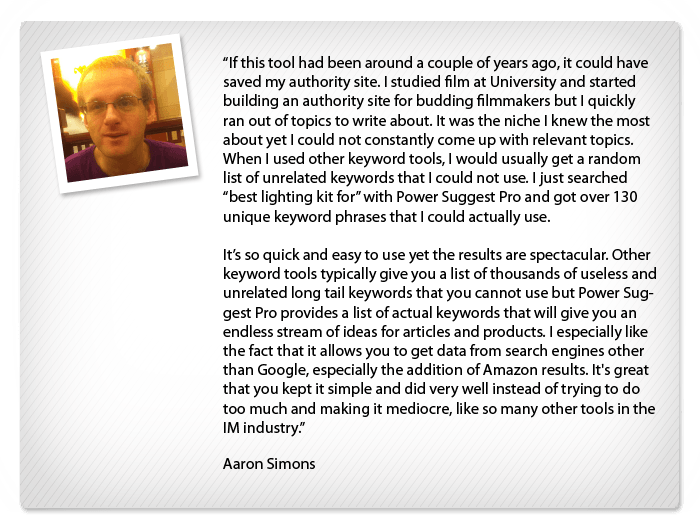 Why is Power Suggest Pro one of the Best Keyword Research Tools? There are very few places where you can discover keywords that people are typing into search engines. One of the most popular sources is the Google Keyword Planner. Almost every keyword research tool on the market is actually based on data from Google Keyword Planner. Unfortunately, the keywords you'll find in Google Keyword Planner are often too general and not descriptive enough as their real intentions are for use with paid advertising on the Google Adwords platform. On the contrary, keyword suggestions which are used by search engines to predict what users are going to type, offer the most relevant, descriptive and effective keywords available. These are exactly the type of keywords Power Suggest Pro is built to find. If you want to get traffic from Google and other search engines to your website, your website needs to have contents created around keywords that your audience is already using when looking for similar contents, products or services. The best way to discover these keywords, as proven by thousands of successful websites, is to use the very keywords that are auto-suggested by search engines. There's a reason why these keywords are so effective: they are exactly what people are searching for. When you create contents around these keywords, the high relevancy of your contents will be rewarded with significantly increased rankings on search engines, thereby boosting search traffic to your website. One of the most powerful features of Power Suggest Pro lies in its unique capability to find keywords by using the asterisk character as a wildcard. What this means is that you can effectively get Power Suggest Pro to "fill in the blank" for the exact type of keywords you are looking for. Imagine entering "best * for small business" and getting hundreds of keywords that represent products and services small business owners are not only looking to buy, but also willing to pay a premium for. How about entering "is eating * good for health" to find keywords that are perfect for attracting traffic to a website on healthy diet? The possibilities are truly unlimited. This powerful method of keyword research will yield a large number of highly relevant and descriptive keywords that cannot possibly be found with other keyword tools. When you target your ads based on keywords that people are typing into Google or other search engines, these precise keywords will bring the right audience to your website. And when you display your ads to people who are searching for these exact keywords, you will get higher click-through rate (CTR), lower cost-per-click (CPC) and higher conversion rates. As a result, you will spend less money on advertising and generate a better return on investment. For a list of search tactics you can use to uncover a plethora of keywords and insights, check out our Search Tactics Cheatsheet here. It is tempting to think that years of being in our markets and interacting with customers give us a good idea of the needs of all our potential customers. However, our experience may be much more limited than we think. 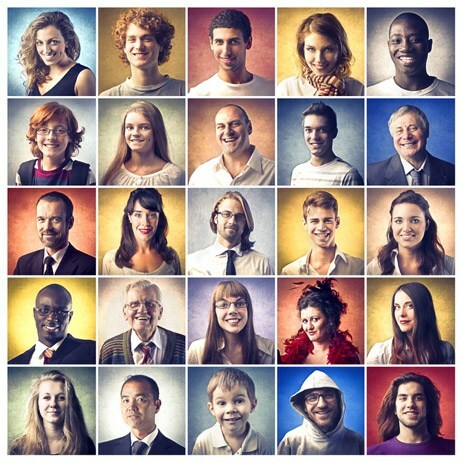 Customer interactions are typically self-selected. In other words, you only talk to people who have found you and those who you think are interested in your products and services. Consequently, opportunities are often missed as we are oblivious to the diverse range of needs in the entire market of potential customers. 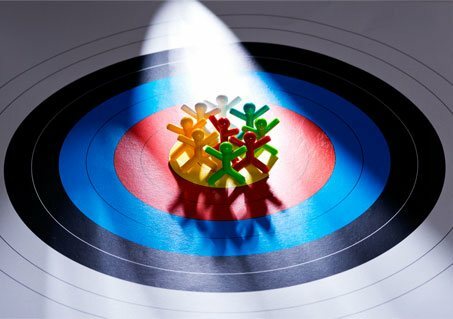 Power Suggest Pro eliminates this blind spot and provides you with a bird's eye view of the comprehensive needs in any target market or audience. With people using much more precise and descriptive phrases in search engines than they do in conversations, it just couldn't be better for gaining insights. Understanding the needs of potential customers enables you to offer related products and services, or improve your existing products and services to attract more clients. The more you know about your potential customers, the more effective your sales and marketing efforts will be, and the more you will be able to create a product or service that is aligned to their needs. With a knowledge of commonly-asked questions in the niche, you can even answer them on your website before you are asked, to attract new customers. "Gain tens of thousands of customer insights with Power Suggest Pro." "how to * for small business" "how to setup voip for small business"
"* tips for small business" "branding tips for small business"
"* software for attorneys" "timekeeping software for attorneys"
"best * for artists" "best website builder for artists"
"* for new parents" "dinner delivery for new parents"
"Discover tens of thousands of niches with Power Suggest Pro." One of the most powerful things entrepreneurs and marketers can do to massively accelerate their business growth is to specialize or focus on a niche. The thought of doing so typically strikes fear at the core of our hearts - "If I specialize, wouldn't I miss out on all of the other opportunities?" In reality, the opposite is true. Trying to appeal to a broad audience usually results in a marketing message that falls on deaf ears. You may have heard the phrase, "the riches are in the niches". Indeed, everyday people spend more on products and services they believe are created specifically for their needs. Someone who owns a Beagle dog would pay more for dog biscuits created specially for the dietary needs of Beagles. A restaurant owner looking to build a software for his business would gladly pay more for a developer who specializes in the F&B industry. You see, if you could tweak your product or service to create a version for a particular niche within your market, you will appeal to prospects in this niche and can instantly command a higher fee or premium. People want what they perceive is for them, preferably exclusively for them. When you focus on a viable niche, not only do you magnetically attract lots of prospects in that niche, you'll often also attract opportunities knocking on your door from other niches. Power Suggest Pro helps you uncover the numerous niches within markets, enabling you to target precise segments of audience in any market. When there's something unique about your product or service that makes niche customers say, "yes, this is for me! ", that's the one they are going to buy. There are often so many niches you can find in a single market that you will often come across several that are being neglected, overlooked or poorly serviced. Now, these are low-hanging fruits and you'll always find these opportunities in our world of infinite choices. There is absolutely no better way to find new profitable business opportunities than to turn your attention to the "pain points" of people. Identify a clear, burning, irritating pain or frustration in a niche market, and selling a solution that solves that pain will be easier than you think. You don't actually need a revolutionary idea to build a highly profitable business. All you have to do is to look for pains, frustrations, wasted money, inefficiencies or a market gap where a good solution for a problem does not currently exist. Successful entrepreneurs and internet marketers seldom take chances on ideas without first identifying clear demands in the market. You never want to risk spending time, money and effort on a "solution" without any evidence that it is what people need or (better yet) are already actively looking for. Offering a product or service that provides the solution to a problem that people are already looking to solve is clearly the fastest and surest way to success. 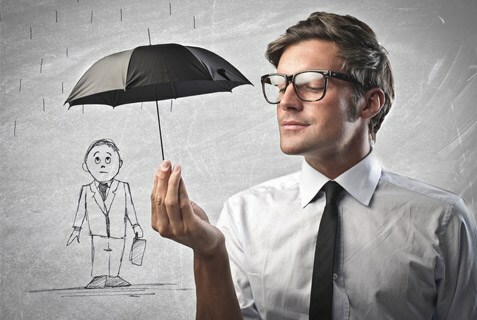 With guesswork taken out of the equation, you'll never build a business based on "hope" again. There are so many ways to uncover the pain points of people using Power Suggest Pro that you will probably never run out of profitable business ideas again. "Uncover tens of thousands of pain points with Power Suggest Pro." 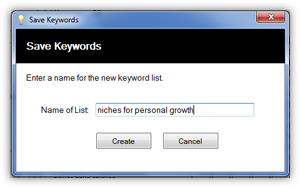 "Find millions of long tail keywords with Power Suggest Pro." 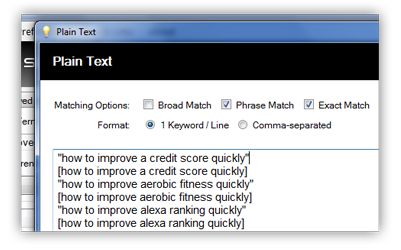 Since long tail keywords are simply more specific keywords, they can really be found using any type of query. For instance, the example queries we have provided earlier for uncovering pain points and market niches are also excellent candidates for identifying long tail keywords for content ideas that actually attract traffic from search engines to your websites. If you are not sure what are long tail keywords, they are simply less popular and generally more specific keywords that are being typed into search engines. As a result, they have also less search volumes and competition. Its significance was first recognized several years ago. While many have forgotten about this pot of gold, not only do long tail keywords still work today, they are growing in effectiveness. With search engines pushing to understand more complex search queries, long tail keywords are playing an increasingly important role for gaining search traffic by publishing contents that specifically target them. Recent changes to the inner workings of search engines are strong testaments that search engines are gradually shifting their attention to the meaning of an entire query instead of individual words. In other words, search results are increasingly optimized to answer very specific "user intents". Consider the following keywords: "home remedies for bed bugs" and "how to overcome anxiety". They are considered long tail keywords as compared to much more competitive core keywords like "bed bugs" and "anxiety". An important yet rarely discussed trait of a long tail keyword is a clear user intent. Some SEO professionals may solely focus on ranking pages but that is merely the beginning of the game for businesses. What really matters is whether they are ranking for the right keywords that convert a visitor into a customer. The final goal in most cases is to increase conversions: to make people click, to make them buy, enquire or subscribe... to make people commit to some action on a website that ultimately converts to revenue. For instance, when someone searches for "bed bugs", you have very little idea why the user is searching for that. Is the user looking for a solution to a buggy problem? Or is the person looking for general information about bed bugs? Perhaps, the user is just doing a study on bugs. On the other hand, when someone searches for "home remedies for bed bugs", the user intent is much clearer: He's probably looking to get rid of the bugs. There's an instantly higher chance of being able to "sell" a bed bug related product or solution. Long tail keywords can be wonderfully revealing. You can almost always be certain what the user is looking for. Targeting core keywords like "beg bugs" or "anxiety" is rarely going to yield great results even with their high search volumes. In addition, the competition will be monstrous. Clearly, a better strategy than getting a web page ranked high for a difficult keyword is to get multiple web pages ranked high for different long tail keywords with clear user intents. You'll have much less competition and more buyers. The best of both worlds, don't you think? 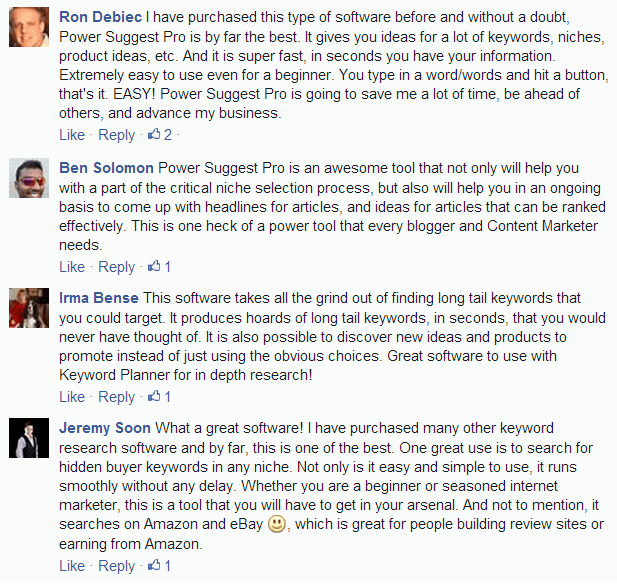 Power Suggest Pro is a long tail keywords powerhouse. By using data from 6 massive search engines, you will be able to find significantly more long tail keywords than with Google Keyword Planner or typical keyword research tools which are usually based on the former. 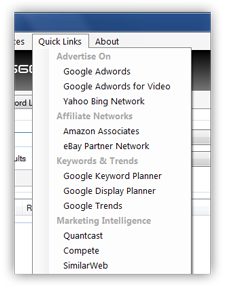 Targeting long tail keywords that can't be found by other tools means even lower competition. Take "user intents" into consideration and these keywords can give a serious boost to your website traffic and conversions. One of the crown jewels of online marketers, especially affiliate marketers, buyer keywords are keywords used by people typically minutes before making purchases. 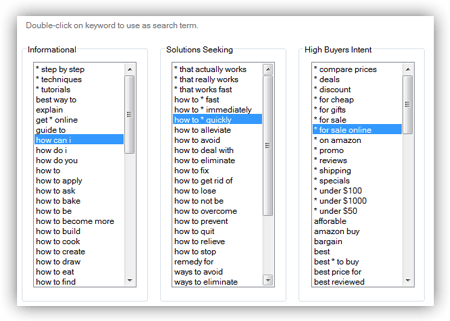 People searching with these keywords may literally have their credit cards in their hands. They have already gotten past the initial stages of looking for general information and are either looking more closely at reviews or finding a website where they can immediately place their orders. Keywords like "buy essential oils online", "custom t-shirt free shipping" or "bluehost coupon" are essentially keywords with very high buying intent and are hence called "buyers keywords". The selling was already done for you in most cases. Buyer keywords are highly profitable opportunities for affiliate marketers who build websites that specifically target certain buyer keywords, refer sales to merchants like Amazon and earn commission checks month after month. Since there is usually not much convincing to do, as you might expect, buyer keywords convert extremely well: a good percentage of visitors actually turn into buyers. While these keywords may not get great search volumes, their sky-high conversion rates pretty much make up for it as you wouldn't need all that much traffic to make sales with buyer keywords. Tip: Don't be thrown off by words like "cheap" or "affordable". Many people would not give them a second look. Little do they know that keywords with words like "cheap" convert really well. Most people searching for "cheap laptops" have already decided they want a laptop. They are just looking for one in a certain price range. If you could bring your website to their attention at this point and if they find your contents useful, several of them may well buy from you or through you (if you are an affiliate). With support for Amazon and eBay in addition to the major search engines, there simply isn't a better tool for uncovering tens of thousands of lucrative buyer keywords you will need to get in front of buyers before they "swipe" their cards. 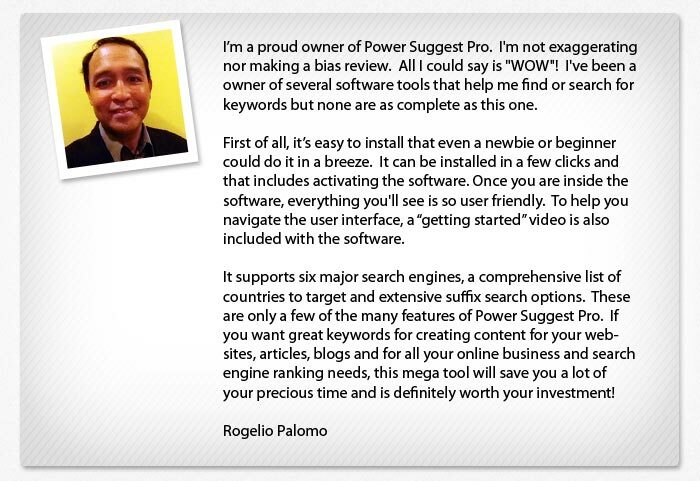 "Unveil tens of thousands of buyer keywords with Power Suggest Pro." 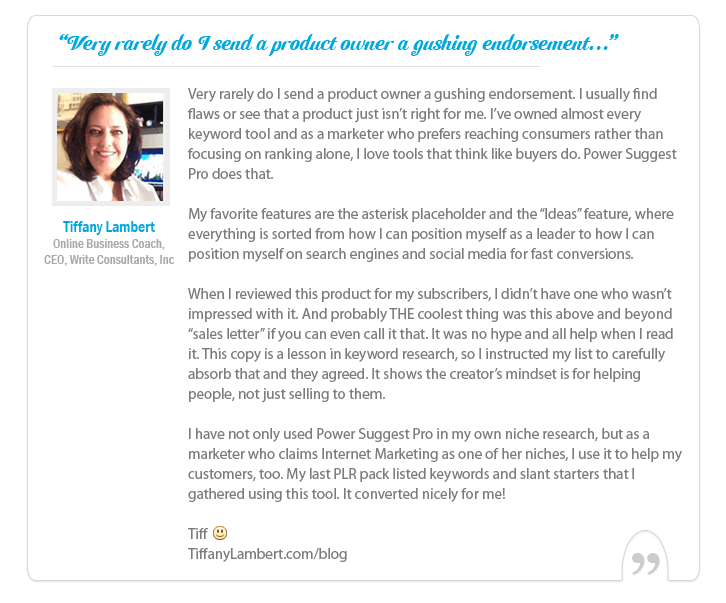 "Power Suggest Pro is going to save me a lot of time, be ahead of others and advance my business." " Power Suggest Pro is so quick and easy to use yet the results are spectacular." 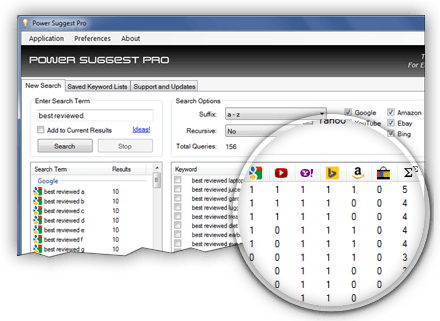 Quickly tell the source(s) of each keyword result for searches performed using several search engines. The numbers in each row indicate the number of times the specific keyword was found by the respective search engines. Click on the column header, "Σ" and keywords that were simultaneously found on multiple search engines will appear at the top of the list, enabling you to identify popular keywords. 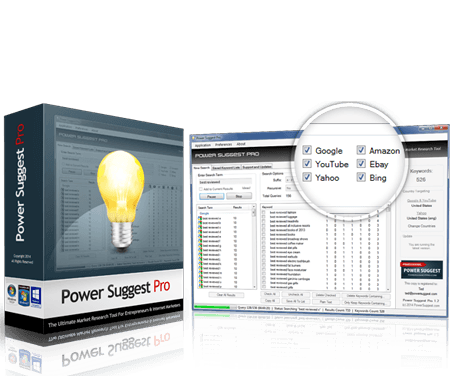 Power Suggest Pro comes integrated with a starter list of over 150 search ideas designed to help you get your creative juices flowing in no time. Organized into 3 categories: "Informational", "Solutions Seeking" and "High Buyers Intent", these search ideas are excellent for getting started quickly. However, do keep in mind that this list represent but a small subset of the infinite search possibilities of Power Suggest Pro. Power Suggest Pro supports 3 suffix options: "none", "a-z", "aa-zz" for light, normal and intensive searching respectively. 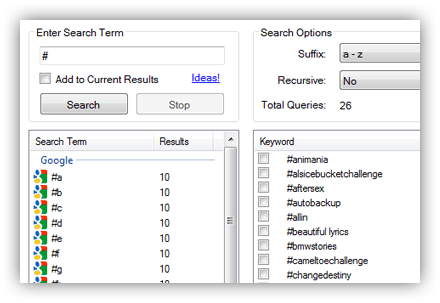 When the recursive option is enabled, each keyword in the first set of results will be automatically searched to quickly reveal any sub-niches or sub-topics. If your target market resides in a specific country or if you are exploring unique opportunities in other parts of the world, geotargeting allows you to narrow your search to a particular country. This enables you to get results that reflect the unique desires, needs and pains of the people in the selected country. Simply enter "#" as your search term and you'll uncover a list of the latest popular hashtags. Hashtags are widely used on social networks like Twitter, Instagram, Facebook, Google+ and Pinterest to tag contents to topics. With the most current widely-searched hashtags at your fingertips, you can leverage on these hot trends, topics or happenings in the world to create viral contents that boost traffic and engagement. Enter "www." as your search term, target a specific country and you'll uncover a long list of popular websites for the selected country. While you can get the top few hundred websites of any country from certain sources, Power Suggest Pro allows you to find thousands of popular websites in any country, enabling you to discover advertising or partnership opportunities, and identify popular products and services in any part of the world. We take customer satisfaction very seriously. Here's our promise to you: If this product doesn't live up to your expectations after you have given it a fair try, contact us within 60 days and we'll refund your payment in full. We take all the risk so you don’t have to. Generate infinite ideas for video contents using "YouTube"
"A single nugget of golden insight or keyword from this tool will pay for itself over and over." For a limited-time only, you have the rare opportunity to get all this power at this low one-time fee. The software will return to its normal price once this limited-time offer ends. Power Suggest Pro works directly on Windows XP/Vista/7/8/10. Also works using VMware Fusion, Parallels or CrossOver on a Mac. Is there any recurring payment required to use Power Suggest Pro? No, there are absolutely no recurring fees. You will own the lifetime license to use Power Suggest Pro for the one-time price stated above. Can Power Suggest Pro run on a PC? What versions of Windows does it support? Yes, Power Suggest Pro works on all PCs running Windows XP, Vista, 7, 8 or 10. Is Power Suggest Pro compatible on a Mac? Power Suggest Pro does not run directly on a Mac. 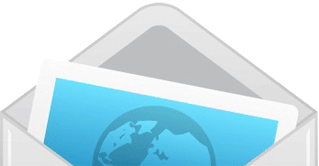 However, you can use CrossOver, VMware Fusion or Parallels to run the software on a Mac. What do the numbers displaying in the search results mean? You'll notice that for each keyword in your search results, a series of numbers is displayed alongside with it. These numbers represent the number of times that specific keyword was suggested by a particular search engine. When only 1 search engine is selected, say Google, these numbers may not seem to be of any use as all the other columns representing Yahoo, Bing, etc will always show a zero. However, when 2 or more search engines were selected for a search, you'll be able to easily tell which keywords were suggested by which search engine(s). You'll also be able to sort the results by clicking on any of the column headers (indicated by the search engines' logos). The last column header (displayed as Σ) represents the total number of times a particular keyword was suggested by all selected search engines. 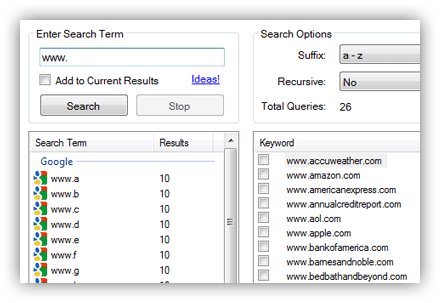 Clicking on Σ sorts the keywords by the total number of times they were suggested, enabling you to quickly spot popular keywords that were simultaneously suggested by multiple search engines. How many PCs can I install Power Suggest Pro on? Each purchase of Power Suggest Pro usually comes with a license for installation on 1 PC. To sweeten the deal, when you purchase during this offer, your license will be good for installations on up to 3 PCs as long as you are the owner of the PCs. This is great if you frequently work on multiple PCs. Are future software updates and releases free of charge? Yes, all future updates and releases for Power Suggest Pro will be made available to customers at absolutely no additional charge. Will I be able to download Power Suggest Pro immediately after payment? Yes, you can be up and running with Power Suggest Pro literally 5 minutes from now. What do I do if I encounter any problems during the order process or while trying to run Power Suggest Pro? Contact us via our support e-mail address below and we are most happy to offer our assistance. Do allow us a working day to get back to you. We'll make sure everything is resolved to your satisfaction. Does Power Suggest Pro display the search volumes of keywords? Power Suggest Pro does not currently display the search volumes of keywords from within the software. 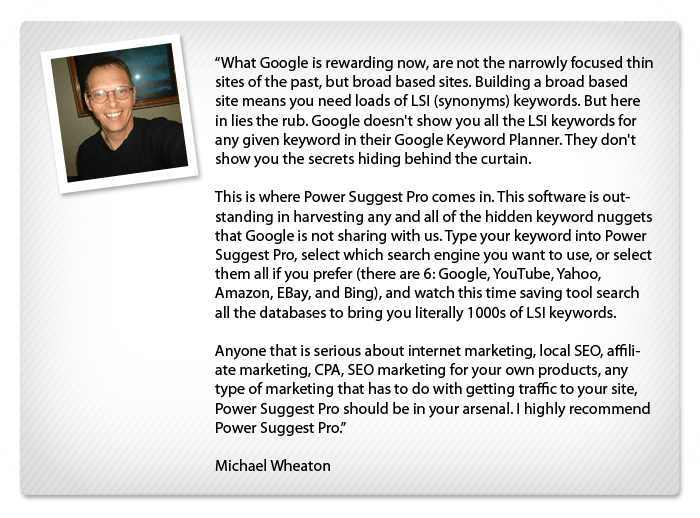 Power Suggest Pro's prime purpose is focused on harvesting an extensive amount of keywords (significantly more than Google Keyword Planner or typical keyword research tools) and doing so extremely quickly. However, Power Suggest Pro enables you to quickly copy and paste entire lists of keyword results to Google Keyword Planner to get search volume and competition data. To do that, simply click on the "Plain Text" button after a search and you'll be able to quickly export keyword results to Google Keyword Planner or any other preferred tool for analysis. We love and value our customers. Contact us if you have any questions or require any help using the software. For Order Support, contact ClickBank by clicking here. We believe the best service we can provide to our customers is taking every effort to build a great product. Power Suggest Pro is a high quality software designed to be so easy to use, you'll likely be on your way without any troubles. On the rare occasion you do get in a bind, please send us a note and we'll be happy to help!